Need Workers! - Tire Rack One Lap of America! Have any news? Send me an email! We Need Workers - Tire Rack One Lap of America! 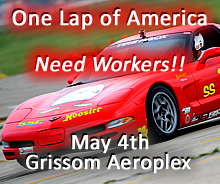 The One Lap of America competitors will be coming to Grissom on May 4th to run an autocross after they leave Tire Rack and start on their week long adventure. We need 30-34 workers to help run the event. We need workers at Grissom by 9:00 and we should be finished by no later than 3. Ask people to contact Raleigh if they are able to work. 317-442-8500 or rvboreen@gmail.com. 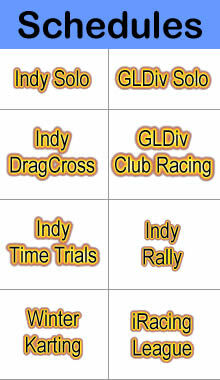 The Indianapolis Region of the SCCA conducts Club Races, Road Rallies, Rally Cross and Solo Competition in the Central Indiana area throughout the year. We have many opportunities for anyone with an interest in cars, motor sports, and competition. Ours is a member-oriented organization and our programs cater to all facets of motor sports enthusiasts. 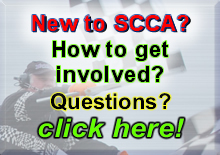 Take a look at the Fast Tracks and also SCCA Inside Line from SCCA. Keep up on rule changes and see what is happening on a national level.